When I was in grade school, fishing was a daily part of my life. Most of my evenings and weekends were spent on the banks of the small pond behind my childhood home. The bass and crappie must have hated me because I fished the pond so much. I loved the feeling I would get pulling a big largemouth from the water. 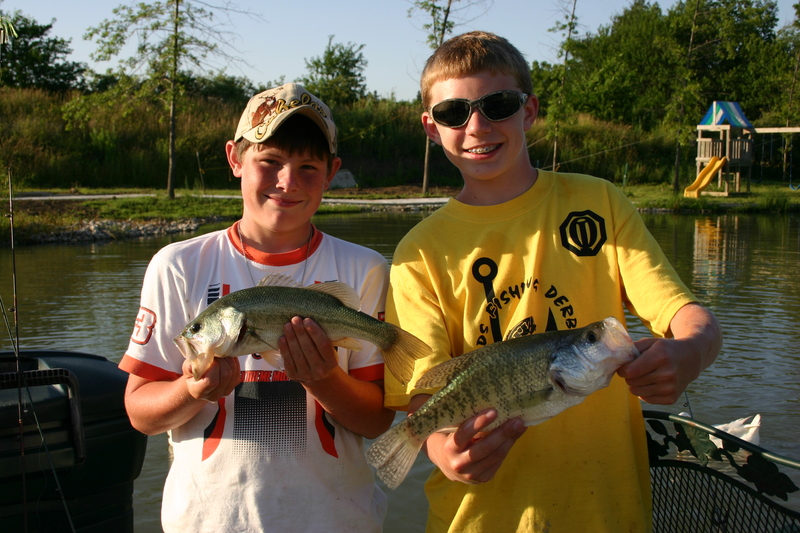 The author (left) with his good friend, Tyler Mahoney, showing off their catch in 2004. I have been to Branson many times and thought I had seen everything it had to offer. From Silver Dollar City to the Landing, from Yakov Smirnoff to the Dixie Stampede, I had experienced it all. Much to my surprise, there was a very exciting attraction I had blindly driven by for years—Lake Taneycomo. Lake Taneycomo, a river they call a lake, flows from Table Rock Dam into Bull Shoals. It’s stocked with thousands of rainbow trout and many elusive brown trout. The bass and walleye are occasionally caught as well, or so I’m told. 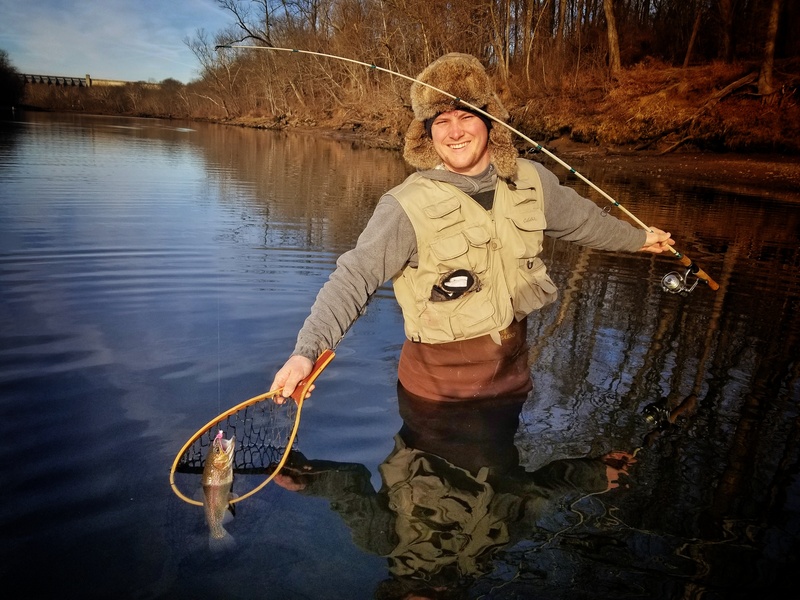 When my friend, Tyler, invited me to fish Lake Taneycomo in early February, I was excited, yet skeptical of my ability to catch fish. I imagined myself struggling to throw the complicated fly rod with its tiny lures and multiple sizes of line. After all, that’s the only way to catch the elusive trout I had thought. Luckily, that couldn’t be further from the truth. Our journey started a couple hundred yards above “Trophy Run”, a place not far below Table Rock Lake Dam. 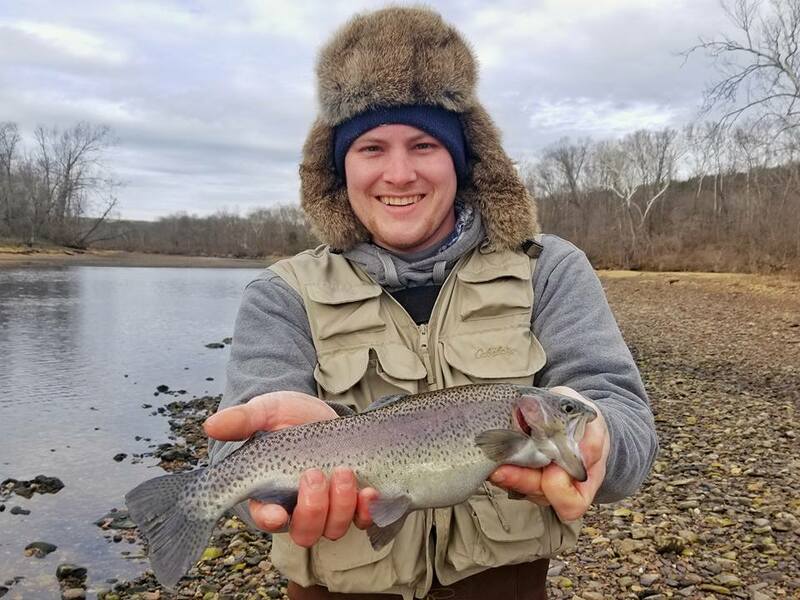 The area is home to many large trout, or “footballs” as Tyler affectionately called them from their fat, football-like resemblance. I was pleasantly surprised to learn I didn’t need a fly rod to catch trout. My mind was blown as we pulled out some lightweight, spinning reels with two-pound test line. Our bait was a hand-tied 1/16th oz. marabou jig that Tyler bought from Lilley’s Landing. Sculpin and Pink were our colors of choice. It wasn’t long before I realized just how picky trout can be. You might throw a Sculpin jig right in front of their face and they will have no interest. Then you can make one simple color change and they will devour it. Pink became my favorite throughout the weekend. My first couple casts yielded no fish, which did not surprise me. I was focused more on my footing and the cadence of my retrieve. Once I settled in, I felt a tug and my rod bent over towards the water. Seconds later, I landed my first rainbow trout of the trip. It was exhilarating pulling the fish right up to me as I stood in the water. As I caught more fish, I noticed even the small fish put up a good fight on two-pound test. 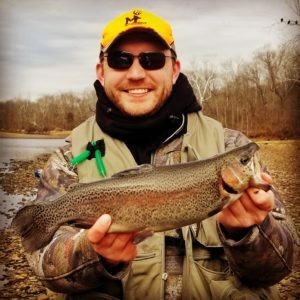 I landed a particularly colorful rainbow and it was then I realized I was totally hooked on this experience. The author nets one of his many rainbow trout early in the morning below Table Rock Dam. When the fishing slowed, we moved downstream right to the top of Trophy Run. We were there about a half hour with no action when Tyler hooked up with a two-pound rainbow trout! Both our hearts raced as he fought the fish. It pulled, tugged, and fought for what seemed like an eternity. Finally, the fish gave in and I scooped him up in the net. It’s amazing how much strength they have even after a long fight. He took a moment to admire his catch then released the fish back into the lake. Soon after, we received a call from our friend who rented a boat for us all, so we needed to pack up soon to meet him. As I retrieved my last cast, my lure stopped abruptly. I thought I was snagged, but realized in an instant I hooked into something big. Tyler just landed perhaps the biggest trout of his life, and now mine was on the line. Excitement turned to panic as the thought of the thin, hair-like line potentially snapping shot through my mind. The adrenaline made the fight feel long, but it passed in the blink of an eye. As I scooped him up in the net, I felt a rush I hadn’t felt in years. He weighed in at a pound and a half and was a beautiful fish. As I held him for the picture, Tyler explained the importance of not handling the fish too long. They are strong, yet delicate fish. I released him gently back into the water and watched as he swam back under the downed tree from which he had ambushed my lure. The author with the biggest trout of his life caught above Trophy Run on Lake Taneycomo. At that moment, that intense feeling of happiness that only comes from fishing overwhelmed me. The memories of pulling crappie and largemouth out of the pond behind my childhood home came flooding back. I felt the calming peace that only a February morning on the mist-covered banks of Lake Taneycomo can provide. No two vacations to Branson have been the same for me, just as no two fishing trips are the same. I can honestly say wading the waters of Lake Taneycomo renewed my love for fishing. I’ll definitely be back to Lake Taneycomo to chase not only the elusive trout, but the feeling of euphoria that comes with it. Branson, Lake Taneycomo, Missouri, Payden Hays, Rainbow Trout, Table Rock Lake, Trout Fishing. Bookmark.